Known across the nation as The Money Coach, Lynnette Khalfani-Cox’s experience as a former Wall Street Journal reporter for CNBC gives her first-hand knowledge of the best ways to manage money. But she also knows how to fight back from the brink of bankruptcy-at her lowest point, Lynnette had $100,000 in credit card debt before she created a program to pay it off-and turn her financial life around. Her phenomenal approach to debt elimination has helped tens of thousands to build financial fitness, often seeing real results in just 30 days. 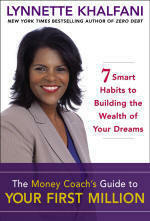 The Money Coach’s Guide to Your First Million unfolds Lynnette’s unique, seven step plan with strategies to help you manage money, pay off debt, build a great credit rating, and work towards growing and preserving wealth. Lynnette also delivers methods to find top-return investments in real estate and the stock market and protect new wealth with insurance.